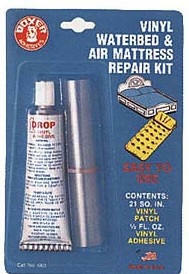 Repair Products for Vinyl Liners and Products, Pool Accessories and More. Contains : 2 oz tube of #100 vinyl adhesive. 130 sq. in. of patching vinyl and dauber-applicator. Packed : 24 per DISPLAY CARTON. All surfaces must be clean. Cut round corners on patch. For inflatables and light gauge vinyls, apply adhesive to patch sparingly and press tightly to surface to be repaired. Allow to dry for 24 hours. A face mask or underwater goggles should always be used when going underwater to make repairs. For deep underwater repairs, cut round corners on patch. Apply adhesive to patch and fold patch over upon itself. When you reach the damaged area under water unfold patch and apply immediately to liner, squeezing out all water bubbles. Do not disturb patch for at least 48 hours. Allow 4-7 days for full cure. 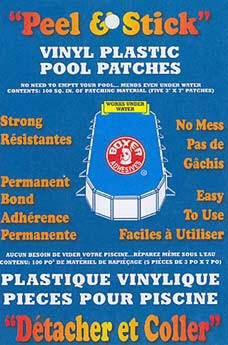 For quick and easy vinyl repairs without liquid adhesive, use Boxer Vinyl Plastic Pool Patches. This is a clear tape where you peel off the paper backing and apply immediately. Vinyl Plastic Pool Patches are excellent for other applications such as vinyl upholstery and waterbeds. Products to Repair soft and rigid vinyl. #759 Contains : 1oz tube of #100 vinyl adhesive. 42 sq. in. of patching vinyl. Packed : Prepared for shipping, 24 per carton. #760 Contains : 1/2 oz tube of #100 vinyl adhesive. 21 sq. in. of patching vinyl. Packed : Prepared for shipping, 24 per carton. All vinyl surfaces must be clean. Cut round corners on patch. For inflatable and light gauge vinyl, apply adhesive to patch sparingly and press tightly to surface to be repaired. Allow to dry for 24 hours. A face mask or underwater goggles should always be used, when doing underwater repairs. For deep underwater repairs, cut round corners on patch. Apply adhesive to patch and fold patch over upon itself. When you reach the damaged area under water unfold patch and apply immediately to liner, squeezing out all water bubbles. Do not disturb patch for at least 48 hours. Allow 4-7 days for a full cure. Contains : 4 oz can of #100 vinyl adhesive, dauber-applicator and 500 sq. in. of patching vinyl. Packed : 24 per shipping carton. Our Deluxe Kit features an ample supply of liquid adhesive in a can with screw top and attached dauber-applicator, plus plenty of patching vinyl. All surfaces must be clean. Cut round corners on patch. For inflatables and light gauge vinyls, apply adhesive to patch sparingly and press tightly to surface to be repaired. Allow to dry for 24 hours. Contains : 1 pint cans of #100 Vinyl Adhesive and dauber. Contains : 4 oz can of #100 Vinyl Adhesive and dauber. All surfaces must be clean. Cut round corners on patch. Boxer brand vinyl patches are perfect for this application. For inflatables and light gauge vinyls, apply adhesive to patch sparingly and press tightly to surface to be repaired. Allow to dry for 24 hours. For deep underwater repairs, apply adhesive to patch and fold patch over upon itself. When you reach the damaged area under water unfold patch and apply immediately to liner, squeezing out all water bubbles. Do not disturb patch for at least 48 hours. Allow 4-7 days for a full cure. Contains : 100 sq. in. of patching vinyl. Packed : 24 per display carton. Inflatable Plastic Items: This material is suitable for repairing pinholes and small punctures in inflatable items. Clean area thoroughly where repair is to be made. Remove paper backing, place patch over hole, and PRESS DOWN FIRMLY. Do not inflate for 30 minutes. Bond improves for several hours. Under Water Repairs for any size hole: Clean area thoroughly where repair is to be made. Remove paper backing, place over hole, and PRESS DOWN FIRMLY. Other Uses : Any vinyl plastic item can be repaired with this product, such as vinyl plastic upholstery in house or car, shower curtains, air mattresses, pool covers, inflatable toys, and more. Contains : 45 sq. in. of patching vinyl. Packed : 24 per shipping carton. Same as #10, except with 45 sq. in. 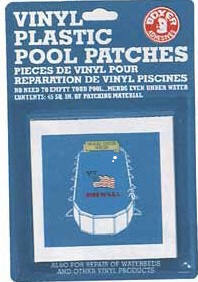 vinyl plastic pool repair patches (tape). This clear tape repairs vinyl without liquid adhesive, EVEN UNDER WATER. Just remove paper backing and apply. Inflatable Plastic Items: This material is suitable for repairing pinholes and small punctures in inflatable items. Clean area thoroughly where repair is to be made. Remove paper backing, place patch over hole, and PRESS DOWN FIRMLY. Do not inflate for 30 minutes. Bond improves for several hours. Contains : 1 oz. tube adhesive plus 42 sq. in. of patching vinyl. The vinyl adhesive with hundreds of uses. 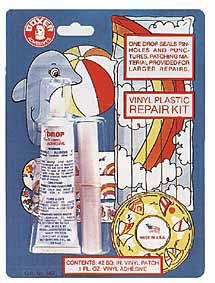 1 Drop seals pinholes and punctures in inflatables. Ample patch material is included for larger repairs. Bonds vinyl to most other surfaces. 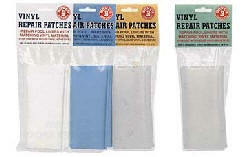 Packed : 24 per shipping carton Pinholes and punctures can be sealed without patches by applying a drop of adhesive over the damaged area and allowing it to dry. For areas larger than a pinhole or puncture, cut a patch larger than damaged area and round the corners. Apply adhesive to patch. Immediately place over damaged area and press out air bubbles. Warning : Contains Methyl Ethyl Ketone. Avoid prolonged breathing of vapors. Do not use or store near heat or flame. In case of eye contact flush with water for 15 minutes. Get medical attention. Keep out of reach of children. Packed : 24 per shipping carton. Pinholes and punctures can be sealed without patches by applying a drop of adhesive over the damaged area and allowing it to dry. For areas larger than a pinhole or puncture, cut a patch larger than damaged area and round the corners. Apply adhesive to patch. Immediately place over damaged area and press out air bubbles. Contains: Two pieces of heavy 20 gauge vinyl. Over 260 sq. in. Contains: Two pieces of 12 gauge clear vinyl patching material. Over 260 sq. in. Contains : 4 oz Fast Setting Liquid Adhesive #700. 1 sq. 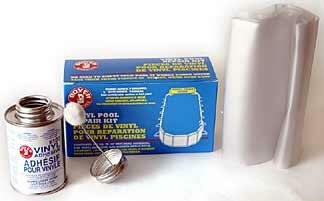 ft. fiberglass cloth with adhesive applicator in can. Damage caused by freezing and other causes repaired like new! Surfaces should be clean and dry. Cut a patch of fiberglass cloth of proper size for repair (should bridge cracks by 2 inches or more). Apply liberal amount of adhesive to damaged area, which will be covered by fiberglass cloth. Immediately apply patch to wet adhesive. When adhesive is dry, apply second coat with applicator, being sure to seal edges. Contains : Two - 4 FL. OZ. plastic jars of EP 3000. 1 each resin and hardener. Packed : 12 per shipping carton. NEW, larger quart size of EP3000 Underwater Setting Epoxy. 2 - 16 OZ jars: one resin, one hardener. Consistency of peanut butter, but white in color. This is our finest all purpose epoxy. WORKS UNDER WATER and mends almost anything, anywhere. Mend cracks in concrete, replace loose tile, even use as a grout. Will not adhere to vinyl plastic. Consistency of peanut butter, but white in color. Clean surfaces to be repaired with a clean cloth or an abrasive pad. Measure equal parts of both resin and hardener. Mix thoroughly for two minutes. For underwater repairs, scoop the mixed epoxy adhesive into a sealable plastic bag (ie: zip-lock bag). Seal the bag and snip off a bottom corner away from the sealed end. 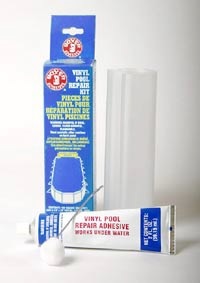 Squeeze out the epoxy underwater into cracks or tile to be repaired. Use a water moistened stick or finger to smooth the epoxy. If you use your finger, be sure to remove epoxy from skin (immediately with soap and water) or (fingernail polish remover) as epoxy adheres to skin when cured. 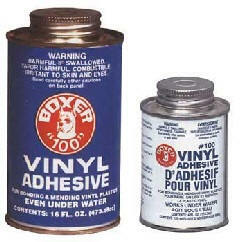 Boxer Adhesives Frequently Asked Questions (FAQ). Repairs Soft And Rigid Vinyl Plastic. Products That Even Work Under Water. 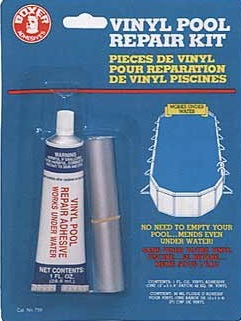 Products For Above Water Vinyl Repairs. Products To Repair Splasher Pools. When epoxy is used at temperatures under 70°F, it will take longer, than the normal 1-2 days to cure. Perhaps, as long as a week. Self-Stick Patches should not be applied under 70°F. Vinyl adhesive can be used below 70°F, but care must be taken to squeeze out all air, from under the patch.